Champion – a specially-formulated, pet pig food. Always fresh, it provides a complete naturally balanced diet for good health and disposition. Developed by leading experts, Champion is unique… the result of extensive research, the practical experience of breeders, and the professional advice of veterinarians. It is the state of the art; Champion is the result of what we now know after 28 years of managing this unusual breed. 100% natural, made from all natural grains and fibers. Champion contains no fillers, meat, by-products, or artificial preservatives. Provides A Complete Balanced Diet. Champion takes natural ingredients and fortifies them with all the essential nutrients your pet pig needs, including selenium and the antioxidants, vitamin E and beta carotene. Nothing is more important in maintaining good health than a well-balanced diet. Providing the right balance can be the challenge. The balance between what your pet pig needs, good nutrition… and what they want, to feel full and satisfied. Finding a food that delivers the correct balance of protein, fat, and fiber is important… it can make your pig a Champion, too. Too Much Protein Can Be A Problem – High protein and fat over time can cause “over-conditioned” (fat) pet pigs and that can lead to health problems and a shorter life. Not Enough Fiber Can Be A Problem, Too – Fiber provides bulk in the diet and aids in the digestive process. A lack of sufficient fiber may also lead to an unsatisfied, “empty” feeling and grumpiness. You Can Trust Champion! It is always milled to an exact formula. It’s right on our label, making a big difference for you and your pet with better digestibility, predictable results, and a healthier animal. Champion Premium Potbellied Pig Food provides a nutritionally complete and balanced diet for both good health and disposition… with 14% Protein, 2% Fat, and 13% Fiber… your little Champion will love it! Recommended by veterinarians, happy pet owners, and healthy, contented pigs. Do I need to provide supplements when I feed Champion? No. Champion is a complete food and it provides everything your little champions will need to stay healthy and fit. Your vet may prescribe a topical supplement to treat a specific condition. Does Champion contain an acidifier? No. Acidifiers are used to treat a specific urinary tract stone condition where PH is considered to be a contributing factor. It is not recommended for everyday use because acidifiers may interfere with the animal’s normal urinary PH and lead to other problems. Although the exact cause of stones are unknown, one of the best ways to prevent them is to make sure your pig has plenty of water and the opportunity to urinate frequently. Yes. In fact, it contains the maximum recommended amount of Selenium and Vitamin E which must be used together. Caution: Using Selenium as a topical dressing can be dangerous and toxic in uncontrolled quantities. Selenium deficiency is very rare in pet pigs. Does Champion contain any medications? No. Pet Pigs are generally healthy and do not require medicated food. In addition, over using medication can reduce their effectiveness when needed. Does Champion use any preservatives? No. 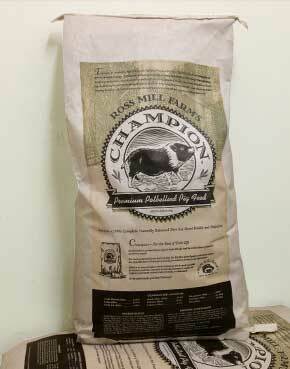 Champion is milled in small quantities to ensure freshness. It also contains Beta-carotene and Vitamin E as natural preservatives. When purchased, it will have a natural “shelf life” of six months. I was introduced to Champion Potbellied Pig Food over twenty years ago and have been using it to feed my pigs ever since. Unlike other potbellied pig food, Champion is specifically formulated just for the potbellied pig. It contains all natural grains and fibers not to mention other important ingredients that help a pig’s health and digestion. I believe that this food has helped aid in my pig’s health and I am proud to say that they have lived to be 17 years of age and older. The best thing about Champion Potbellied Pig Food is that when I am about to run out, I contact Ross Mill Farm and ask for another bag and it is shipped out right away. I am surprised how fast it gets here. I don’t have to go to a store and purchase it… Champion Potbellied Pig food shows up right at my door a couple days later. And the price is fantastic, much cheaper than others. I can honestly say that after 20 plus years of feeding my potbellied pigs Champion Pig Food that if you have a potbellied pig, Champion is the food that you should be feeding them. I am so glad that I was introduced to it when I was! My pigs and I couldn’t be happier with it. I love my pigs beyond words and give them the best of everything. Both Emmett and Pygmy were raised on Champion Potbellied Pig Food. I can’t imagine a better food. For over 19 years I have only purchased Champion. I have nothing but healthy and happy pigs to show for it. 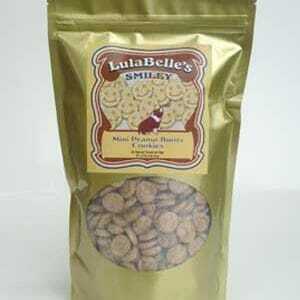 They love Lulabelle’s Smiley Mini Pig Cookies, too.